Eurois nigra is a large (FW length 22 - 26 mm) powdery black moth with white markings and a gray hindwing with a silvery white margin that flies at middle to high elevations east of the Coast and Cascade Range crests during the summer. The forewing is slightly mottled powdery black and white, palest at the base and in the median area, and often showing warm ochre to orange patches. The transverse lines are black, double, with light gray filling. The basal and antemedial lines are most evident at the costa. The postmedial line is weakly scalloped, most evident in relatively pale specimens. The pale subterminal line is dentate and usually preceded by a black shade or series of black chevrons. The terminal line is a series of black triangles between the veins. A series of white dots are present at the ends of the veins at the base of the dark fringe. The hindwing is silvery medium gray, lightest at the margin, with diffuse dark gray discal spot, postmedial line, and wavy submarginal band. The hindwing fringe is silvery gray and is bordered by a thin dark gray terminal line. The head and thorax are dull charcoal gray with scattered white scales. The male antenna is bead-like. 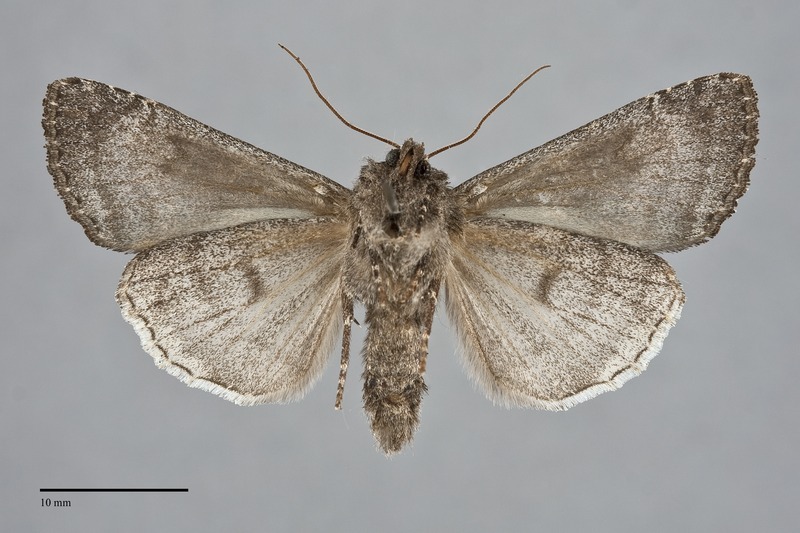 This species can be confused with dark specimens of Eurois astricta, but it is dark brown rather than gray, and lacks the distinctive banded light and dark gray hindwing of E. nigra. 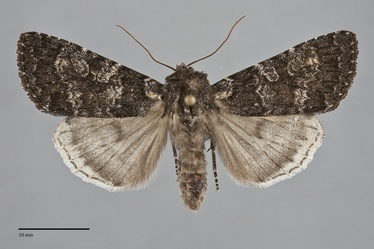 Eurois nigra also resembles several other dark gray moths that fly in high-elevation forests, particularly Polia and Papestra species in the tribe Hadenini. None of these species have a silver-gray hindwing with a light terminal area and fringe that are typical of E. nigra. As with other members of their tribe they have eyes that are covered by tiny hairs, while those of Eurois and other species in the tribe Noctuini are bare. This species is widely distributed throughout the mountains of western North America, and is particularly common in quaking aspen forests of the Rocky Mountain region. In the Pacific Northwest, it is uncommon to common in spruce-fir forests along the summit of the Cascades and in the Siskiyou Mountains at high elevations, and in mixed hardwood-conifer forests or ponderosa pine forests of the Rocky Mountain region at middle elevations. An isolated population occurs in quaking aspen forests at high elevations in the Steens Mountains of southeastern Oregon. Eurois nigra is found in mountains throughout the Pacific Northwest, particularly east of the Cascade Mountain crest. This species has a more limited range than our two other Eurois species. It is found in the mountains of western North America, including and to the west of the Rocky Mountains. Its range extends north to central Yukon Territory and south to Arizona and New Mexico. No information is presently available regarding larval foodplants of this species, but it probably feeds on hardwoods based on related species. Quaking aspen (Populus tremuloides) in the Salicaceae may be a favored foodplant based upon the habitat, although other hardwoods must also be used in the Cascades and Siskiyou Mountains where quaking aspen is rare or absent. Adults fly in the summer, primarily in July and August in our region. They are nocturnal and come to lights.